Michael Kappen, 22 University of Nebraska—Lincoln Phantom Regiment Mellophone/Trumpet 2008-2011 What do you think is important in choosing which corps to audition for? Really, just do what feels right. Each corps has its own identity and the members try to uphold that. Talk to current members to see if it's a place you feel you'd belong. Audition camps are also a fantastic way to see how a corps is run, so don't be afraid to experience multiple corps first hand before deciding which is right for you. And don't ever let distance or cost get in the way of marching. If you find a place that you love, there will always be ways to make it work out. How do you like to prepare for an audition? 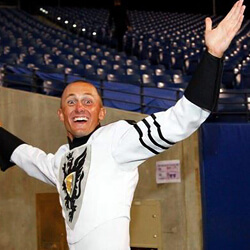 Drum corps is a very unique activity in that it requires both a high level of musicality and physicality. To be ready for an audition, you must at the top of your game in both. That means hitting the practice rooms AND the gym often. However, being prepared for an audition isn't just about preparing musically and visually. One must approach an audition with confidence and have the ability to learn quickly. Confidence is a necessity in drum corps, as each individual performer must be able to put in his/her own part out on the field. You must have a very open mind and be able to accept criticism in order to constantly improve. The staff sees these qualities in potential members, so start developing the right attitude and work ethic now. What was your experience like the first time you auditioned for a corps? The first time I auditioned for a corps was with Regiment in 2007. I really didn't know what I was getting myself into, and I was just tagging along with some friends of mine. Lo and behold, I was cut at the first camp, and while I wasn't completely sure what it was that I was being cut from, it still left a burning desire inside of me to return and make a mark. The next year I came back even more determined, and while my set of skills was maybe slightly better than the year before, I would say it was my newfound attitude that carried me through camps and ultimately led to me receiving a spot. What advice would you give to somebody who is nervous or unsure about auditioning? Firstly, go to camps! Each camp is so much more than simply an audition. You really do get to experience what the drum corps is like over a weekend. From working with the staff to meeting both old and new members, you will develop as a player/marcher and find out if that particular corps, or the drum corps activity as a whole, is right for you. Even if you get cut—like I did my first camp—you will still come away from the weekend knowing much more about the performance quality and identity of each corps. Getting cut doesn't mean it's the end of your drum corps experience. You can return to audition in future years, or you can join another corps in order to build the necessary skills to get a spot in any corps you wish. Next, when it comes to nerves, use them to your advantage. I know nervousness may be difficult to control at times, but when it comes down to it, if they hinder your performance, it's a bad thing! Control them as much as possible and use your heightened awareness to perform at a higher level. Any other tips? Try and be noticed (in a good way)! Throughout the auditions and rehearsal camps, try to integrate yourself with veteran members. For instance, while in a visual audition, you may feel like marching next to vets would make you look bad in comparison, but it can serve a couple purposes. First, just being around others who perform at a higher level than you can push you to do better than you think you can. Second, it shows the staff that you are willing to step up to the plate and prove yourself. Honestly, if you haven't marched in a drum corps, you aren't going to march at the same level as the vets, but striving to be like them and putting yourself out there might just get you the spot that you so badly want. The same applies while in music rehearsals. Learning how to act in rehearsals as well as adjusting to each corps' rehearsal style is very important. There's no better person to learn this from than someone who has gone through it multiple times. Learn more about corps audition dates, locations and additional info.